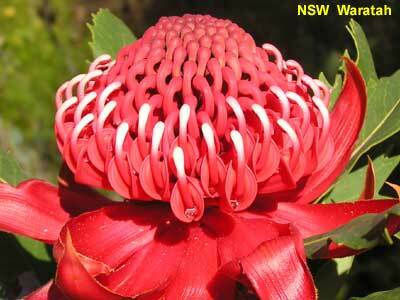 The NSW Waratah - isn't it magnificent! It stands proudly as one of the most beautiful and majestic flowers in the world. 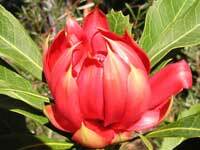 Waratah is aboriginal for "beautiful"; Telopea is Greek for "seen from afar". 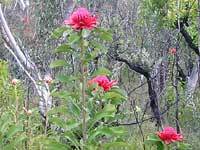 The NSW Waratah grows to a height of 3 metres with leaves around 15cm in length. 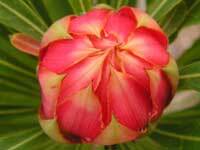 The crimson flowers are produced in early spring and have a diameter of 15cm. 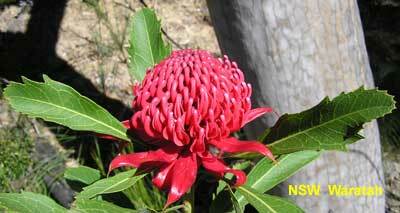 The Waratah is indigenous to the Sydney region and may be found in its natural state from the NSW Central Coast down to Batemans Bay on the NSW South Coast, and to the western slopes of the Great Dividing Range. 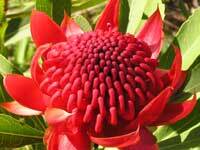 In 1962, the NSW Waratah was proclaimed the floral emblem of New South Wales. 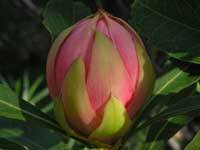 The following images show the bud to bloom progression. They are not of the same flower. Waratahs regrow after fire from their lignotubers underground. Nearly all of the images shown here were from plants that were "razed" by fire a year or two earlier. 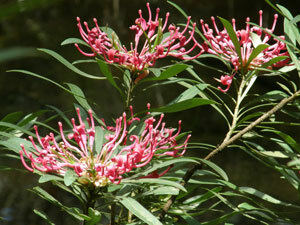 Waratahs and several other plants thrive in the years immediately following a bush fire before the canopy closes up. 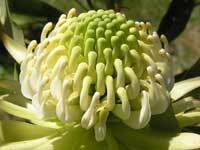 Waratahs are pollinated by birds - the seed pods maturing in early winter. 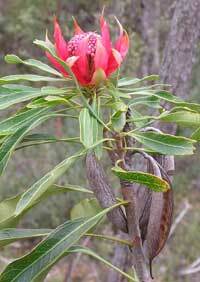 Although usually a vivid crimson in colour, the NSW Waratah occasionally has white tips or is pink as shown here. 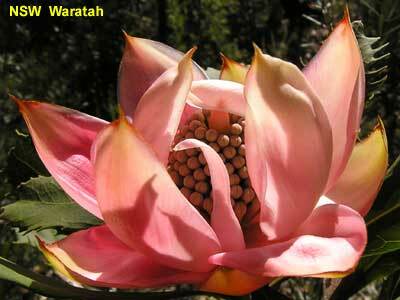 However the only white NSW Waratah that currently exists was found in the NSW Southern Highlands. Cuttings were taken and the Wirrimbirra White cultivar was produced. 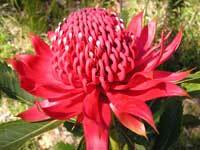 Additional Waratah images that were just too brilliant to leave in the bottom drawer. The photos above were taken in the upper Blue Mountains. The White Waratah was growing in a Leura garden. 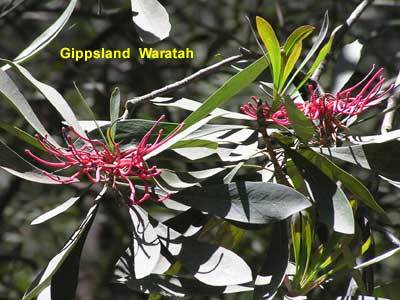 The Gippsland Waratah is a tree over 10 metres tall. It is found in north eastern Victoria and into New South Wales. The images of the Gippsland Waratah were taken on the Bonang Highway, 50km north of Orbost in Victoria. 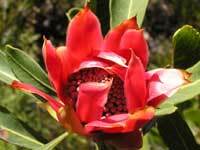 The Monga Waratah is similar to the Gippsland Waratah. 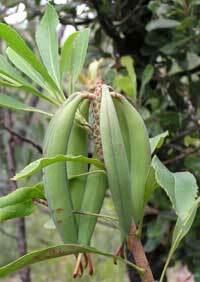 However its leaves are half the size - up to 15cm long and 20mm wide, and have prominent veins on the upper surface. It can be found in rain forests and river banks in the ranges between Braidwood and Moss Vale in New South Wales. 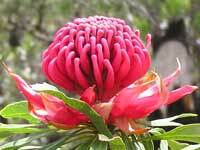 It is also known as the Braidwood Waratah. These photos were taken in the Monga National Park, which is near Braidwood. 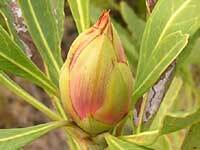 The Tasmanian Waratah is endemic to Tasmania. 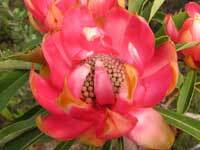 Here's an informative treatment of the Tasmanian Waratah and Waratahs in general. 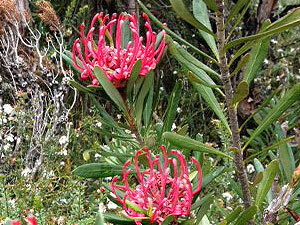 The image of the Tasmanian Waratah was taken by Ron Gardner at Cradle Mountain in Tasmania.